It’s said that all Empire’s eventually crumble. Even the legendary Alexander the Great couldn’t maintain dominance forever. The ICWA (Much like the fallen empire of Alexander) Once knew greatness. It was at one time the mainstream standard of MSN. Unfortuantly time has taken it’s toll and coroded the empire down to it’s very foundation. Where magnificent stars once walked, rubble now lyes. In most casesm ruin is all that reminds us of the Glory that once was, History books tell us tails of Heartbreak and Triumph, but only by there word and the vividness of our imagination can we actually see these fallen lands in a time of dominance and success�?In Most Cases. As you enter the once prosperous land of the ICWA, you have a chance to change the very mechanics of history as we know it. Inn complete contradiction to the pattern of History, we and we alone have the opportunity to rebuild and recreate a once prosperous and prestigious land of Glory. Stadiums with thousands upon thousands of people screaming their lungs out in addolation or disdain based on your actions�?Hundreds of Millions watching TV every week and buying Pay Per Views every month just to see you doing what you do best And doing it under a banner that the world had thought long dead�?A Banner that reads I…�?C…�?W�?.A. Step by step you have the opportunity to take this rubble and rebuild an Empire. 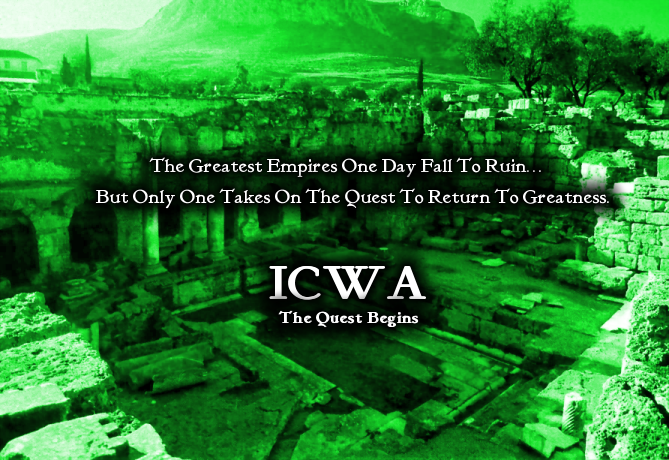 As you begin your quest to aspire to the top of the business and take the fallen ICWA with you, it won’t be easy. Wrestling in small buildings for a hundred people and no TV. Getting paid very little and expected to do insurmountable amounts of work. It won’t be easy, but, If you’re successful, then it won’t be about the glory of an empire�?It’ll be the glory of the people who rebuil the empire. Join The Quest for Glory�?. Join the I.C.W.A.